Today, CFBA is introducing Flight of the Earls by Michael K. Reynolds. It’s 1846 in Ireland. When her family’s small farm is struck by famine, Clare Hanley and her younger brother, Seamus, set out across the ocean to the Promised Land of America. Five years prior, Clare’s older sister Margaret and her Uncle Tomas emigrated in similar fashion and were not to be heard from again. But Clare must face her fears as she lands in the coming-of-age city of New York. There she discovers love, adventure, tragedy, and a terrible secret which threatens to destroy her family and all she believes. 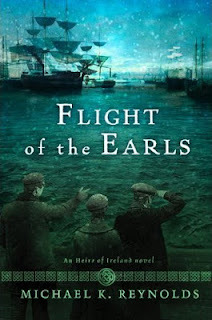 Flight of the Earls is the first book in a historical novel trilogy based on Irish immigration in the 1840s. I was pleasantly surprised with Flight of the Earls. I expected a deeply historical tale, but instead discovered a remarkable immigrant tale full of memorable characters and surprising twists. I enjoyed learning about the San Patricios (Mexico’s Fighting Irish) - something I’d never known about. Although I didn’t care for the abrupt subject change to war during the book, it kept Seamus’ character alive for book 2 in this new trilogy. Reynolds is a great storyteller with an easy-to-read style. I enjoyed and recommend Flight of the Earls and am looking forward to the release of book 2 this summer, In Golden Splendor.